Ratshack Reverb is a detailed model of that classic of classics, the Realistic Electronic Reverb. As anyone who has owned this unit (which is just about everyone...) knows, it was actually an analog delay, and we've done our best to exactly replicate the sound and quirks of the original. We've even modeled the distortion that occurs by running a line signal in to the mic inputs. 2. DRM has been removed. 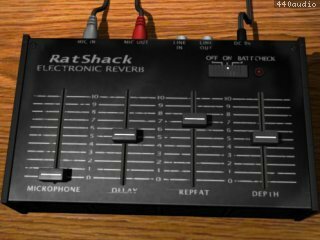 Ratshack Reverb v2.1.0 has been added to the store, and is a free download for all previous owners. New installers, OS X Lion-compatible. 64-bit Native versions on both Win and OS X. Completely rewritten, using Audio Damage's analog delay simulation found in Ronin and DubStation. Now available for OSX Universal Binary AU and VST, as well as Windows VST.